Free download WinPatrol latest version. WinPatrol has been around since 1997 and has customers who have been actively using it since before the turn of the century. Why? Because it works and plays well with others! 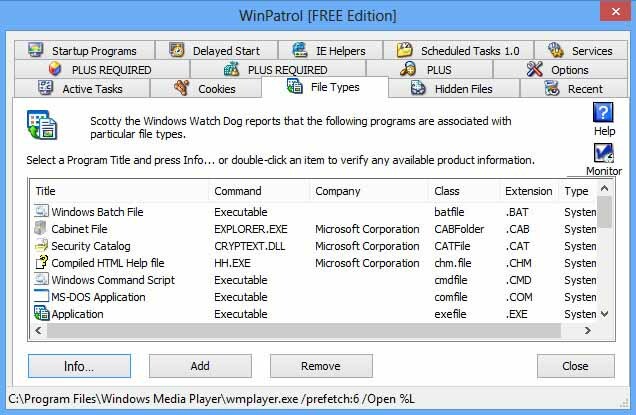 WinPatrol runs on Windows XP, Vista, Windows 7, Windows 8.x, Windows 10 & supports Windows 64-bit features without conflicts with other programs. Adding WinPatrol to your arsenal of protection provides a layered security approach required when even legitimate programs try to install unwanted toolbars or other add-ons. Features are; Speed up your computer’s start-up by delaying start-up programs you don’t need right away. Protect registry key values from being changed without your permission. Protect your hosts file. Detect and review new start-up programs. Get alerted to new Windows Services. Moreover, Lock-down file type associations. Get alerted if something tries to change your Home Page. Remove unwanted browser add-ons like BHO’s and Toolbars. Review, Display and Kill MULTIPLE running tasks with a single click! And much, much, much more.